A Miracle of Science: Perhaps your sensors don't even detect boogeymen! My script does involve a lot of blowing up ships, doesn't it? I just got back from a business trip, and I'm dead tired, so that's all I'll say today. Wait. It's all I'll say except for this: The icon for this update is Doctor Juruna, the mad scientist who is Dr. Haas's rival/love interest. When we were kicking this page around I commented to Jon that signing such a treaty was kind of a dumb thing for the Martians to do. Supposing Martian ships are menaced by pirates, or, say, a mad scientist hijacks a military vessel and launches an attack -- is Mars helpless to respond? Jon pointed out that it's not foolish at all, actually: Mars genuinely isn't interested in projecting force anywhere, so they don't lose anything by signing, and if they do change their minds... er... mind, it's not like the rest of humanity has any way of standing up to all of their crazy space technology. So Mars only needs to obey the treaty as long as it wants to. Any similarity to current events is left as an exercise for the reader. In other news, the all-seeing eye of MoS's referrer logs informs me that Legends of the South Side kindly linked to us the other day, and so I'd just like to extend to them a firm, hearty handshake. 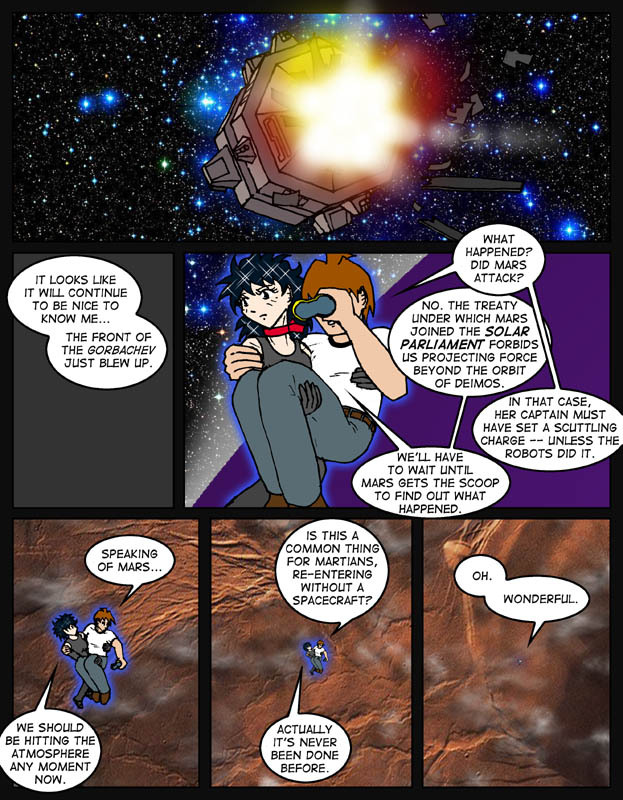 And speaking of webcomic links, lately I am enjoying Instant Classic quite a lot. You should too.